Parboiling the peppers speeds up the baking time, allowing this dish to go together quickly. 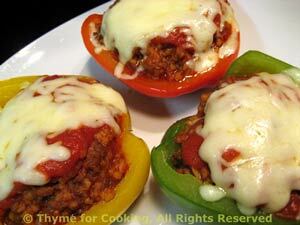 Use any color bell pepper that appeals to you. When buying, look for 4-sided peppers, they'll lay in the dish better and hold more stuffing. I like to use 3 smaller peppers - more colorful, but 2 large would work as well. If you have any Carrot/Tomato sauce left from Friday, add it with the whole tomatoes.